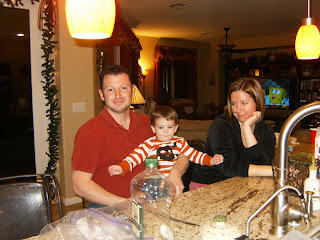 The Tao of Gini: You are NOT going to believe this one! If you didn't read 3 posts back, you may want to stop reading, scroll down and check it out before continuing. So our plans for New Year's Eve were for Chris, Allison and James to come over and spend the night, make homemade pizzas, watch a flick, watch the fireworks, and hit the sack. So everyone arrives with overnight bags, dogs and crates, games and homemade pizza dough - the latter being the building block to our yummy evening. So Chris, Hannah and I run out to Albertson's for the ingredients we are going to need to top the pizza's and apparently everyone else in this town has waited until the very last minute, like the three of us, to purchase their holiday necessities - the place is a zoo! Anyway - down the aisles we go gathering, gathering, gathering as we are decided what kinds of pizzas. We are going for - 1. 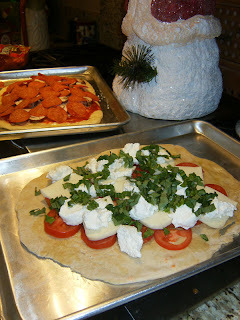 Fresh tomato, fresh basil, fresh mozzarella and ricotta, 2. Grated Parmesan cheese, 3. 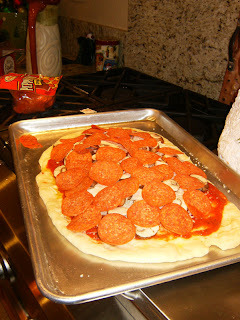 Red sauce, pepperoni, mushroom and cheese, and 4. BBQ chicken and sauteed onion with cheese. 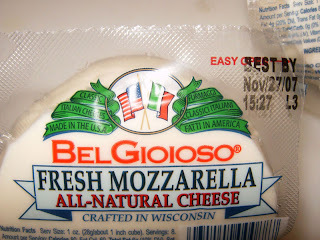 How's the date on that FRESH MOZZARELLA??????? Back to Albertson's for Chris. All ended well. 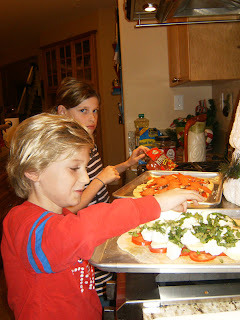 Here are the kids creating their masterpieces. 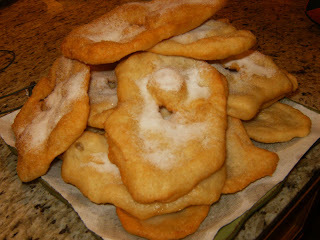 Whenever homemade dough is in our homes - we have to have fried dough for dessert - sprinkled (OK, covered) in granulated sugar. Mmm Mmm. Moral of THIS story - you MUST check all dairy products that carry an expiration date AT ALL TIMES!!!! Oh, and I guess - on night's like this, it is senseless to count calories. Just eat and enjoy yourself!! 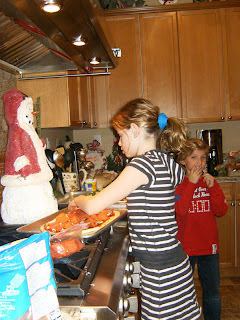 Oh the pizza party's..I memmer those days!!! We tried to feed the cheese to the dogs but they sniffed it and turned their noses up at it. Well Allison maybe you shoulda found a homeless person and offered it to them because APPARENTLY (according to "annonymous" a few posts back) homeless people don't mind eating expired dairy products. Hey and you coulda swung by Big Apple Bagel and grabbed an expired pint of milk for said lucky homeless person to wash it down with! Dinner ala sour!